You have a great idea for an app or a startup but you have have absolutely no programming skills. You can either search for a technical co-founder who shares the same vision – which is a lot harder than it sounds – or look at outsourcing to a competent and affordable agency that can help you put something together (but without the soul). Or you may consider picking up some coding skills yourself and try to make it happen. That’s where One Month Rails (www.onemonthrails.com) comes in – the online training platform offers aspiring entrepreneurs, students and professionals seeking to expand their career skills by offering a series of online video lessons, hands-on exercises, code samples and additional resources to learn web development with Ruby on Rails. Part of Y Combinator’s Summer 2013 batch of startups, The online resource for web development to date has taught more than 9,000 people Ruby on Rails, one of the most widely-used web programming technologies today. Many students who have undergone the program and picked up web development include Sandi Lin, CEO and co-founder of Seattle-based Everpath (www.everpath.org), Bradley Kipp, co-founder of Virginia-based UpHex (http://uphex.com), and Mike Wyatt II, a GM factory worker-turned-developer based in Missouri. 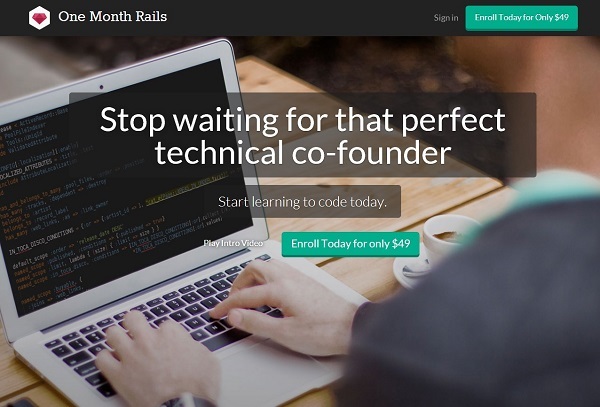 One Month Rails has secured seed investment from Andreessen Horowitz, Yuri Milner, General Catalyst and Maverick Capital.